Economists and banking: why such misunderstanding? I had a curiously contrasting week. A few days ago, I attended a private conference organised by the Adam Smith Institute with Bob Hetzel, of the Richmond Fed. The following day I attended the annual Moody’s banking conference. Both events talked about the financial crisis and low interest rate environment, yet illustrated the huge gap between both worlds. In his explanation of what went wrong in 2008/9, Bob Hetzel never mentioned the words ‘banks’ or ‘financial system’ even once (at least from what I can remember). Consumer demand, investment, liquidity, monetary policy, central banks were the terms used. This is typical. Too many economists nowadays seem to have forgotten that banks exist and that the traditional way of implementing monetary policy has been for central banks to deal with commercial banks (primary dealers, lending facilities…). Of course, the financial crisis also saw central banks use extraordinary measures by buying other types of assets resulting in the impact of the asset price channel of monetary policy grow. Still, over the last couple of weeks, a number of famous economists and economic commentators have written articles showing their limited understanding of how banks really work. First in line is Scott Sumner. While Scott is one of my favourite economists, who opened my eyes on a number of things over the past few years, his stubborn dismissal of the importance of banks is unfortunate. In an Econlog column published a few days ago, Scott urges us to “stop talking about banking”. Monetary policy is independent he says, a separate phenomenon. You print more currency than the public wants to hold, and they’ll bid up prices. How do you inject it without banks? Simple, pay government worker salaries in cash. Or buy T-bonds for cash. Cantillon effects don’t matter, unless the central bank is doing something bizarre, like buying bananas. This is an unrealistic story. Does any central bank print money and pay government salaries? No. At least not in the developed world. From whom do central banks buy T-bond? From…banks, and from funds, which then leave the newly acquired cash in…banks. Or which purchase other assets to replace those T-bonds, in which case this cash also ends up in banks. And in truth, the hot potato effect described by Leland Yeager can easily get interrupted by the operational realities of the financial sector. In short, financial institutions can wear heat protection gloves. There is no need for IOR for excess reserves to build up. The implementation of monetary policy remains subject to strong structural rigidities (it isn’t the goal of this post to list such rigidities, although it may be the topic of a later one). Against all evidence, Sumner keeps denying that banks, their business models, their regulation, and their accounting standards, play a role in transmitting monetary policy, booms and busts. He (as well as Hetzel) considers himself a follower of Milton Friedman’s monetarism. Yet Friedman seemed to understand more about banks than Sumner does. Indeed, Friedman and Schwartz partly blamed bank accounting standards (in particular mark-to-market accounting) for the catastrophic banking collapse (and money supply collapse) of the Great Depression. banks had to dump their assets on the market, which inevitably forced a decline in the market value of those assets and hence of the remaining assets they held. The impairment in the market value of assets held by banks, particularly in their bond portfolios, was the most important source of impairment of capital leading to bank suspensions, rather than default of specific loans or of specific bond issues. Hence Friedman describes a self-reinforcing insolvency issue that originates in a liquidity problem, and which led to a contraction of the money supply. He also thinks that outright defaults of bad loans made in the 1920s, while limited, could have been the trigger that led to the tight liquidity situation. He adds that large open market purchases of those assets could have maintained their market value and prevented a number of bank failures (although I have to object that this is akin to a bailout of the system, with strong associated moral hazard). Now, Friedman may have understated the extent of the solvency crisis during the Great Depression. What is certain is that the Great Recession involved a larger insolvency component. In the US, default rates started to increase by end-2006, and house prices by end-2005 (see charts below), way before liquidity conditions tightened as a result of this large-scale solvency issue. But overall, Friedman was wiser than many of his followers as he understood the role of banking in amplifying (if not creating) crises. Against this background, it is unsurprising that many other economists seem clueless about banking. Krugman is bewildered that banks demand higher rates (see also here). He understands that banks experience margin compression (a rarity among economists though…), but doesn’t seem to get that a healthy economy needs healthy banks and that unhealthy banks disrupt the money creation process (and hence the inflation that he wants to see appear). He also misses the fact that low central bank base rates could simply just stop being transmitted to the economy. Instead, he uses his usual personal attacks (‘permahawkery’, ‘interest group’, easily influenceable Fed and BIS officials – really? After all the regulatory rounds of those past few years? – ‘lobbyists’, ‘corrupt’…). Of course banks are going to lobby. This doesn’t imply that we should simply dismiss those claims without even attempting to analyse their substance. According to the worst-case scenario involving a 100-basis-point reduction in the interest rate, these German banks could see a 75% drop in pretax profit by 2019. Even if they adjusted their balance sheet structure, the decline would still be 60%. Surely Krugman could explain to us how an economy can thrive with a dying banking system. Dombret, while worried, nevertheless warned banks that low rates in Europe were here to stay. Then there’s the lack of a good theory for why lower interest rates should compress banks’ margins. Changes in the fed funds rate should affect both long-term and short-term rates equally. If the Fed tightens, depositors will demand higher deposit rates from banks, and banks will demand higher interest from borrowers. After an initial period of adjustment (to allow for existing loans to roll over), the effect of rate changes on spreads shouldn’t be substantial. Really? As I explained now some time ago (see chart below from this old post), above a certain threshold the nominal level of interest rates is irrelevant (the real level might be to an extent). 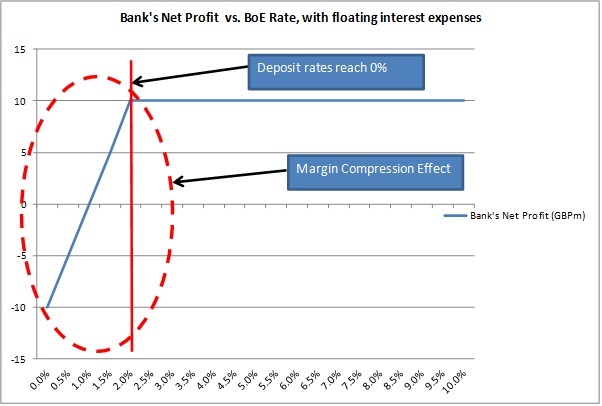 It is when deposit funding reaches the zero lower bound that banks start experiencing troubles, in particular if their loan books are composed of a lot of variable-interest loans (the worst case scenario being loans contractually based on the central bank base rate, such as what happens in the UK mortgage industry with loans being priced at BoE base rate + spread). The result of this is that the spreads between deposit rates and lending rates narrow while banks’ cost structure doesn’t change. A simple P&L analysis shows why this is an issue. In the absence of other major sources of revenue growth, and independently of credit risk considerations**, banks (which are stuck with portfolios of multi-decade maturities low rate variable mortgages) have to start increasing the spreads on new lending to rebalance their revenue stream in line with their cost of intermediation. Which defeats the purpose of lowering the central bank base rate to stimulate lending. Smith adds that a Fed tightening would increase banks’ interest expense. This is inaccurate. Deposit-funded banks don’t have to raise deposit rates unless under competitive pressure if and when they try to attract more funds to grow their lending business. 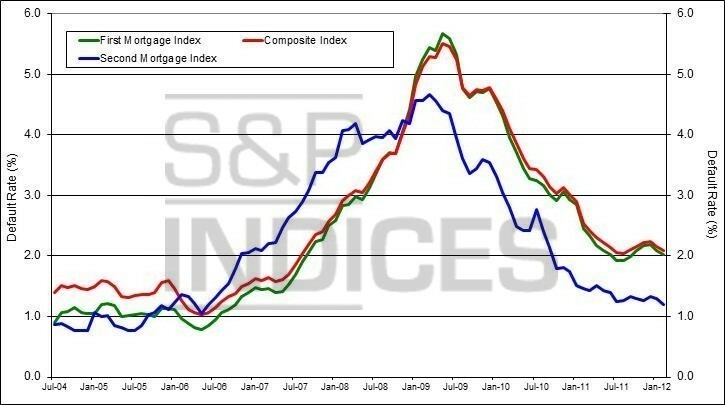 But on the other hand variable rate lending automatically generates higher interest income***. There is indeed an argument that monetary easing helps banks by lowering default rates, and hence banks’ cost of risk, which boosts their bottom line. But the net effect is far from clear, especially in the long run when banks have fully repriced their books to factor in wider credit risk spreads. And in the end, it all demonstrates that understanding banking mechanics is crucial to monetary policy. *Or banks can lend to capital light sectors, such as real estate, which isn’t included in inflation measures such as the CPI, while avoiding capital intensive asset classes, such as SME lending. Consequently, new money keeps being recycled in housing, and never shows up in CPI figures. **Don’t get fooled by sudden changes upwards in net interest margins. NIMs aren’t risk-adjusted. When credit risk rises, banks increase the cost of credit to offset the increased cost of risk and likely loan impairment charges. NIMs then look like they improved. But ‘real NIMs’ (ie, risk-adjusted NIMs) didn’t. Compare Germany and Spain for instance: German NIMs have fallen as credit risk has remained low, whereas Spanish NIMs seem to hold up well, but this hides a decline in risk-adjusted margins. ***He also referred to Japan as a counter example of a rate rise that did not help banks. But in this case, rates didn’t rise above the threshold I was talking about above, so the example is still irrelevant. Update: Scott Sumner’s reponse at Econlog. I think I really have to write a post on the structural rigidities at the micro level that I mention above (when I find the time…). The economists you mention who don’t get banking and don’t want to are all macroeconomists. Banking is part of micro and macro guys hold it in low esteem while micro guys defer to macro. In macro, monetary and fiscal policy are supposed to be omnipotent and be able to plow through any obstacles that micro might set up. So they refuse to learn anything about any micro subject. All the world but the macro economists recognizes that mainstream macro policies have been a complete failure, but Sumner, Smith and Krugman will never admit it even to save their lives. The good thing is that they are turning macro into a joke. The bad thing is they’re destroying the credibility of all economics with most people. I think many of them seem to assume that the micro world is constant. So economic issues that appear between two periods must be due to macro considerations. Unfortunately, micro rigidities can easily break an economy. And any sort of macro stimulus will either fail or lead to distortions if applied in such circumstances. Monetary policy cannot overcome overregulation.